It's finally here! I'm not sure if I even mentioned it, because I didn't want to jinx myself, but my puzzle has arrived in the mail. 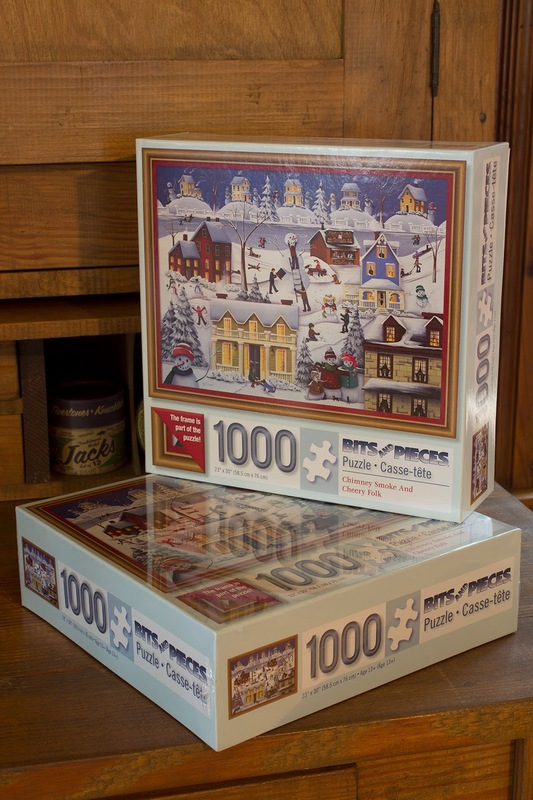 My agent licensed my painting, "Chimney Smoke and Cheery Snow Folk", to a puzzle company and it's now available at Bits and Pieces. They included a frame which is actually part of the puzzle, glue, sponge to apply the glue, hangers and hooks so you can put it on your wall. I know what puzzle I'll be working on this winter! Do you enjoy puzzles? How exciting! The puzzle looks as if it would be a lot of fun to put together. I do like putting puzzles together in January and February. Much success with this new venture, Cathie. Awesome, and yes I love puzzles. I think I need some Cathie Holman fabric with little cupcakes and houses! congratulations, it looks like a fun one. fabric would be amazing too. Congrats! When we lived in upstate NY several years ago, we always worked on a puzzle in the wintertime on a table next to the fireplace. BRAVO, I'll be looking for it. How exciting for you. Congratulations, new friend. I am always sooo in awe of artists...and writers..and anyone with talent. I am talentless and dream of one day, waking up able to sing or paint or sew or....anything. However, as I'll be 77 in Dec., I'm finally living with the fact that I just have to enjoy what others WITH talents do.